Kowboj International lives in the present day consciousness as the enfant terrible of independent film making, submerged in a subtle, oftentimes, unfathomable dialogic of subordination and dissent (“Some love”, “Into everything”, “Horseman”), vitriol and violence (“Boil”, “Thrillseeker”, “VertiBird”). 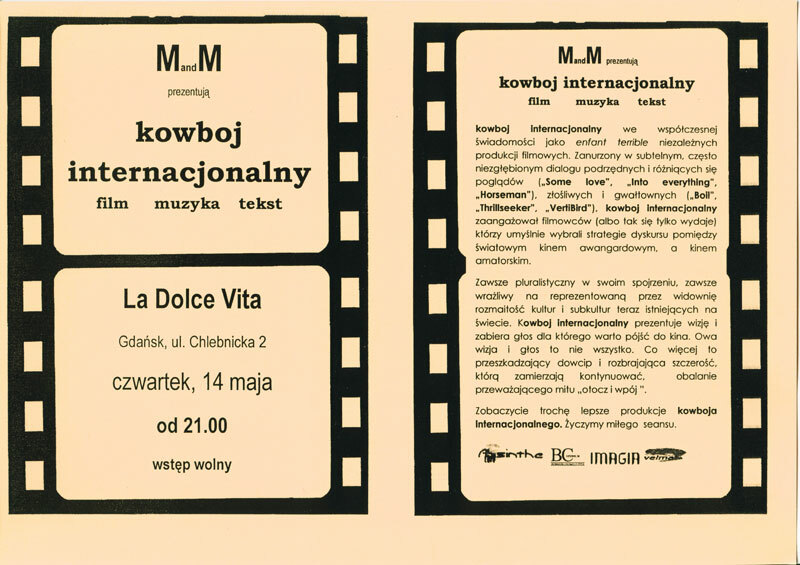 Kowboj International has courted filmmakers (or so it seems) who have deliberately chosen strategies of discourse between avant-garde world cinema and the amateur. Ever pluralist in its outlook, ever sensitive to the diverse audience cultures and subcultures that now exist in the world, Kowboj International continues to be a vision and a voice worth going to the cinema for. A vision and a voice what is more, that through its disruptive wit and disarming candour, will continue to debunk the prevailing myths that “surround and inculcate”. Enjoy tonight’s screening. Some of the best of Kowboj International.